More than 100 million parents have made New Year’s resolutions this year. Four out of five have already quit their resolutions due to burnout and stress. Have you continued with your resolution? Or did you give up already? 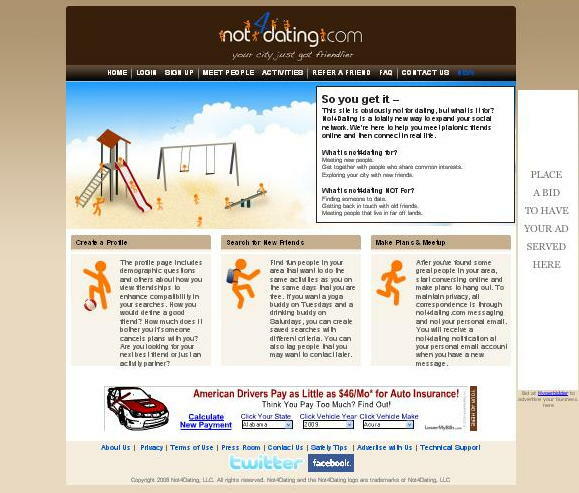 Not4Dating.com is a new website designed for tired, burned out parents. Parents can create a profile page for free and include their photo, age, geographic location, activity preferences and include details on what makes a good friend or activity partner. Parents can then search for new friends locally who enjoy similar activities. After looking for friends, parents can communicate with their selected new friends for free- all while maintaining their privacy by communicating through Not4Dating.com‘s private messaging system. Below is a list of some of the activities parents can chose from. Visit http://www.not4dating.com for more information.